March 6, 2017: A group of spammers, operating under the name River City Media, unknowingly released their private data into cyberspace after failing to properly configure their backups. The leak known as Spammergateincluded Hipchat logs, domain registration records, accounting details, infrastructure planning, production notes, scripts, business affiliations, and more. The biggest discovery, however, was a database of 1.4 billion email accounts, IP addresses, full names, and some physical addresses. Thankfully, the “good guys” found the information—in this situation, it was Chris Vickery, a security researcher for MacKeeper—and reported everything to the proper authorities. June 15, 2017: A hard drive containing the personal information of approximately one million people was stolen from a Washington State University storage unit in Olympia, WA. The hard drive was inside an 85-pound safe, so the university says it has no current reason to believe the individual was able to get inside the safe and steal the data on the hard drive. Information on the hard drive was part of research the university had conducted for school districts, government offices, and other outside agencies; Social Security numbers and health history were among the personal details stolen. The university has sent letters to individuals who may have been affected and will be offering them a free year of credit monitoring. July 10, 2017: A subsidiary of the California Association of Realtors—Real Estate Business Services (REBS)—was the victim of a data breach; it was recently reported to the California Attorney General’s Office. The organization’s store.car.org online payment system was infected with malware that was active between March 13, 2017, and May 15, 2017. When a user made a payment on the website during that time frame, personal information may have been copied by the malware and transmitted to an unknown third party. Sensitive data that had the potential to be accessed included the user’s name, address, credit card number, credit card expiration date, and credit card verification codes. The malware has been removed and the organization is now using PayPal for payments. September 2, 2017: Over 9,000 documents containing the personal information of job seekers with Top Secret clearance were publicly available on an unsecured Amazon serverfor just over six months. UpGuard, a cybersecurity firm, found the public files in a folder labeled “resumes” and reached out to TigerSwan, a private security firm that owned the files. It was discovered that a third-party vendor that TigerSwan had ended their contract with—TalentPen—had failed to take down the files after they were transferred to TigerSwan in February. TalentPen left the files in a bucket site on Amazon Web Services without a password or any type of security until August 24, 2017 when Amazon contacted them about it; at that point, the files were taken down. September 21, 2017: Jay Clayton, Chairman of the SEC, issued a statement about cybersecurity and included details of a 2016 data breach. Clayton wrote that in 2016, a software vulnerability in the test filing component of the SEC’s EDGAR system was discovered and patched “promptly.” However, in August 2017, the SEC learned that incident “may have provided the basis for illicit gain through trading.” The vulnerability allowed access to nonpublic information, but the SEC does not believe there has been any unauthorized access to personally identifiable information. September 21, 2017: SVR Tracking, a San-Diego based service that gives auto dealership and lot owners the ability to locate and recover vehicles, allowed more than half a million customer records to be leaked online. On September 18, Kromtech Security Center found 540,642 records in an unsecured Amazon S3 bucket and notified SVR Tracking of their findings on September 20; SVR secured the bucket within three hours. However, it is unknown how long the information was publicly available online and the data was quite sensitive in nature—it included email addresses, passwords, license plate numbers, VINs, and even the ability to see every single place a vehicle has been in the last 120 days. September 25, 2017: A breach that affected Deloitte, a multinational professional services firm, in March came to light—and the reason is pretty embarrassing for a company that was once named the “best cybersecurity consultant in the world” by Gartner. The firm did not employ two-factor authentication, so when hackers acquired a single password from an administrator of the firm’s email account, they were able to access all areas of the email system. Investigators determined that Deloitte’s biggest clients were of interest to the hackers, but Deloitte insists only a small fraction of its clients have been impacted. September 26, 2017: KrebsOnSecurity reported a breach at fast food chain Sonic after discovering a “fire sale” of millions of stolen credit and debit card numbers on the Dark Web. Sonic learned about the breach when its credit card processor notified them of unusual activity on customer payment cards. Sonic has almost 3,600 stores in 45 states, but it is not immediately known which locations were affected—the company is working with law enforcement and investigators to determine the true scope of the breach. September 28, 2017: Whole Foods Market—recently acquired by Amazon—made a statement regarding the discovery of a recent breach of its payment systems. Individuals who shopped in the company’s grocery stores were likely not affected, but it is believed the unauthorized access occurred in Whole Foods locations with taprooms and full table-service restaurants. The company is currently in the middle of an ongoing investigation and has said it will provide additional updates as it learns more. It has also said that Amazon’s payment systems are not connected to Whole Foods and no Amazon transactions were impacted by the breach. October 6, 2017: Disqus, a blog comment hosting service, revealed that it was targeted by hackers five years ago. The company had no idea it had been the victim of a data breach in 2012 until the website Have I Been Pwned?reached out with exposed user information it had found. In a statement, Disqus says it verified the authenticity of the data and found it was from their 2012 user database, which included information dating back to 2007. User email addresses, user names, sign-up dates, and last-login dates were among the stolen data; hashed passwords using SHA1 with a salt for approximately one-third of users were also public. Disqus does not believe there is any evidence of unauthorized logins, but it has reset the passwords of all affected users. October 9, 2017: In December 2016, it was reported that “more than 1 billion user accounts” may have been impacted by the 2013 Yahoo breach. Recent news, however, shows it was indeed more than 1 billion—much more. Four months after Verizon acquired Yahoo’s core internet assets, it was revealed that every single customer account was impacted by that breach; three billion Yahoo accounts—including email, Tumblr, Fantasy, and Flickr—were stolen. Even after thorough investigations, it is still unknown who was behind the 2013 Yahoo breach. October 12, 2017: After suffering a data breach in December 2015, the Hyatt hotel chain has fallen victim to hackers again. The company discovered unauthorized access to its payment card information for debit and credit cards that were swiped at the front desks of some of its properties. Stolen information includes card numbers, expiration dates, internal verification codes, and cardholder names. At this point, Hyatt believes 41 of its properties in 11 countries were affected between March 18, 2017 and July 2, 2017. Only five properties in the U.S. were targeted: three were in Hawaii, while one was in Puerto Rico, and the other in Guam. Hyatt has provided a list of all affected properties that prior guests can check. November 14, 2017: Los Angeles-based clothing retailer Forever 21 announced that some of its customers may have been affected by a potential data breach. Upon receiving a tip from a third-party, Forever 21 launched an investigation and found certain point-of-sale (PoS) devices were compromised—likely between March and October of this year. The company said it implemented “encryption and tokenization solutions” in 2015 and that it appears the targeted PoS devices would have had encryption that was not operating. 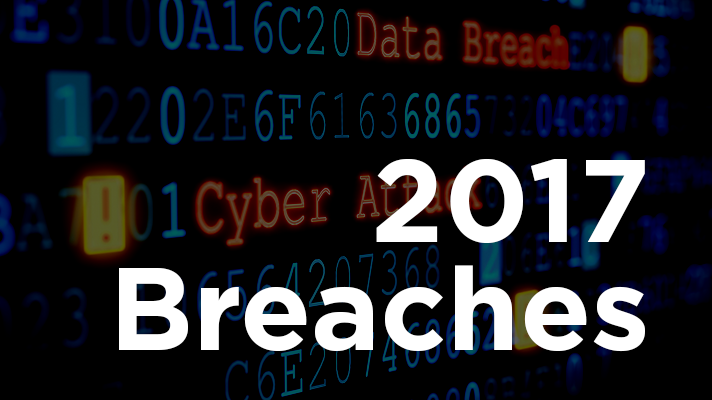 At the time of the announcement the investigation was still occurring, so it is not known how many people may have been impacted by this breach or who is responsible. Forever 21 customers are encouraged to keep an eye on their payment accounts and look for fraudulent charges. November 21, 2017: The ride-sharing service giant Uber revealed that in late 2016, it became aware of a data breach that potentially exposed the personal information of 57 million Uber users and drivers. However, the company chose to pay the hackers $100,000to keep the enormous data breach a secret, instead of immediately alerting those affected by the breach. How did this happen? Hackers did not gain access to Uber’s internal systems, but rather GitHub, a service that Uber’s engineers use to collaborate on software code. Two hackers downloaded the data stored on GitHub, which included names, email addresses, and phone numbers of Uber users worldwide. With our lives becoming busier by the minute, more and more people are relying on services like Uber to make their lives a bit easier and more convenient. Unfortunately, it’s becoming painfully clear that often times, that convenience comes at cost. Who would have thought that a simple ride to the airport could potentially cost you your identity? November 24, 2017: Imgur, the online image-sharing community, had a lot to be thankful for on Thanksgiving—until it received a notification that day about a possible data breach from 2014. Troy Hunt, the owner of the website Have I Been Pwned, reached out to Imgur’s COO on November 23, 2017 to let him know that he had received data that seemed to include the emails and passwords of Imgur users. The company investigated, and by the next morning, had discovered 1.7 million users from 2014 had indeed had their email addresses and passwords stolen. Imgur contacted affected users immediately on November 24 and publicly disclosed the breach on their website that day as well. December 1, 2017: Due to a vulnerability in their network, TIO Networks, who was recently acquired by PayPal, may have compromised the identities of over 1.6 million customers. The compromised data includes bank account information, payment card information, passwords and usernames for accounts, and Social Security numbers. Although there has been no evidence that any of customer data has been stolen, they are still treating this incident as a data breach. PayPal is offering free credit monitoring services to those impacted by this breach.